The trial of two former paratroopers accused of shooting an Official IRA man in 1972 has been put back. The delay is in anticipation of a Supreme Court ruling connected to another Troubles-related death. A provisional trial date of January 2019 had been scheduled at Belfast Crown Court where Soldiers A and C were due to appear. Both men, with addresses given as Salisbury House in London, have been charged with murdering Joe McCann. Mr McCann died close to his home in the Markets area of Belfast in disputed circumstances on 15 April 1972. However, a Crown barrister said on Friday that "regrettably" the original trial date would have to be vacated "as a consequence of ongoing proceedings" in another case of a former soldier facing prosecution in the same court. 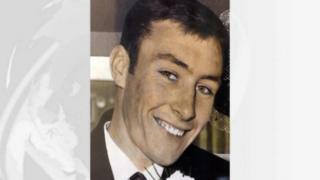 Denis Hutchings is facing charges arising from the death of a man in County Armagh in 1974. The 77-year-old, from Cawsand in Cornwall, mounted a legal challenge in the High Court to have his case heard in front of a jury, as opposed to a judge sitting alone. His challenge was rejected last December, which prompted him to take his case to the Supreme Court in London. This hearing is due to take place next March, with a judgement expected to be delivered four to eight weeks later. The prosecuting barrister said the Supreme Court ruling in the Hutchings case may have an effect on the case involving Soldiers A and C.
In light of this, he asked that the trial date for the two soldiers be vacated. Mr Justice Colton agreed to formally vacate the trial date of January 2019, and set a new provision date for September 2019. When he enquired about the readiness of all parties in the Hutchings case, Mr Justice Colton was told by Hutchings barrister that once the Supreme Court judgement has been made, "we can move quickly". The former British soldier is charged with attempting to murder 27-year-old John Patrick Cunningham in the summer of 1974, and of causing him grievous bodily harm with intent. Mr Cunningham - who has been described as an innocent, vulnerable man - was shot in the back as he ran away from an army patrol near Benburb, County Armagh. Hutchings and 'Soldier B', who has since died, both fired their guns at the fleeing 27-year-old and it cannot be established who discharged the fatal bullet. The pensioner has denied the charges and has made the case it was never his intention to kill or injure Mr Cunningham, but rather he was firing warning shots to get him to stop. None of the three former military men attended court today, while the case involving the two soldiers has been re-listed for a review in a month's time at Belfast Crown Court.